How many gallons of adhesive will I need for 30 - steps & risers using the 48" x 20-7/8" product? Reading some of the info regarding applying adhesive to the stair and stair tread and nosing, you said to put EPOXY NOSE CAULK, does that mean I need to put that on top of the adhesive also or is it not necessary if I apply the adhesive only. Once applied, how should one press or hold the tread on the stairs?Clamps? I will be receiving the "square nose" rubber treads next week,thanks. Do you have qts available? Should the adhesive be applied to both surfaces before putting rubber tread on wood steps? Will (1) gallon cover (14) steps 36" wide ? Can the adhesive be shipped by UPS or FedEx ? How many gallons of adhesive will I need for 12 step covers and 12 risers? White Latex Adhesive for Rubber Floor or Stair Treads (except Heavy Duty Target and Outdoor Rubber Treads), trowelable, water base evaporation cure. Purchased stair treads a while back, just purchased the adhesive. Waiting for installation so don't know how well it is all going to come together yet. Have been happy with purchases thus far which is why I purchased their adhesive. As in all floor coverings the adhesive is important to match with the floor covering. 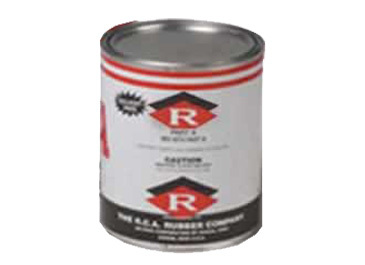 Used on RV floor stair tread replacement, easy to use, confidence it will hold up over time.